It’s Throwback Thursday so let’s go back through Upper Deck’s trading card history and come up with a fun giveaway. The 2014 NFL Draft begins tonight and there is much speculation as to who is going to be the number 1 pick. Back in 1998 Peyton Manning was the number one draft pick, selected for the Indianapolis Colts. It will be interesting to see if any of these potential rookies can come close to the NFL career that Manning has had so far. So let’s put up a throwback card and see if our fans can come up with some great captions for the card! Please share your comical caption to this card for your opportunity to score 10 packs of 2014 UD Football! You can only submit one comment per email address so think about it before you post. Comments are moderated so keep them clean and in good taste as we have a lot of youngsters on these pages. Comments deemed inappropriate will not be posted or eligible to score card set(s). Make sure to review other caption before you post. If you have the same comment as someone else or make slight improvements to it, the credit will go to the first person who posted the comment. You have until Friday morning, May 9 at 8:00 a.m. PT to post your caption before this promotion is closed. Upper Deck will review the captions posted and select one (1) fan who most skillfully share a comical comment to coincide with this card. Only the customer selected to receive the card set will be contacted via email, so please make sure to provide an accurate email address when you leave your comment. Whoa, take a step back. This laser rocket arm just might melt your camera if you get any closer. Manning: I knew my future was bright, but I didn’t know it would be this bright, I can’t even through the ball. Luck: Dude, come on! we’re one throw away from winning, make the play! Manning: I know but I can’t see, that object is to bright. Freeman(To Luck) Yo, 12 what’s he on about?! (To Manning): Yo dude throw the ball. Luck: The object is to bright? (Suddenly realizing)Oh, you mean the flash from UD’s camera? Manning: Yeah something like that. Luck: Get used to it kid, your gonna be a star!! Manning: I guess so! Shining bright. Bob Larney: And Manning throws the ball, and it’s a touchdown. The colts have done it. Luck: Get ready kid, flashes all around! Manning: Gee, I guess I really am gonna be a star! I thought that I would have a ring on all of these fingers by now. Caption: Peyton throws up the number 5 with determination in his eyes. He will not stop till he sees the Super Bowl 5 times and becomes the most successful QB of all time. Get out if my face Eli. Ready for a touchdown high five before even throwing the pass. He is that good. I’m going to get pushed out of Indianapolis by dumb Luck! Better passes, better quarterback, Peyton Manning. What you thought I was talking about Papa John? Get ready Favre and Marino I’m coming for your records!!!!!! No pictures please! I’m in the process of breaking records! I bet he never imagined his Jersey nnuber would be higher the the points his team would score in a Superbowl against the Seahawks. 5 bucks for a football! These night game lights are really bright. Mhmmmm… That apple pie sure looks delicious!!! Guess Upper Deck caught the pass here is the high five! My left hand looks just like Dan Marino’s in this picture. Not one ring, Empty. 5 letters in my favorite word “Omaha”!! 5 letters in my favorite word OMAHA!! 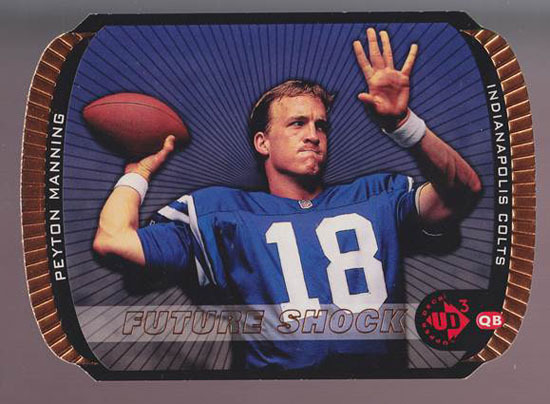 Upper Deck projects Peyton Manning well on this card and predicts the future! I don’t care how you try. You’re not gonna make me laugh! Whoa – time for a manicure! Look at my newly manicured hands! Can’t let them linebackers ruin my perfect day! I am going to throw this ball to Omaha! Closest to the pinky WINS!! Who put the lemons in my Gatorade?!?! Now I can’t say my Omaha’s properly. Who would have thought my brother would have more Super Bowl rings then me?? Future Shock=Safety on the first snap of Superbowl 48. Down…set…Omah… oh nooo! I would hate to be the brother of God. That sure would be hard to live in that shadow. Uhh, hurry up Demaryius Thomas I have to go number two, I’m waiting!!! So whom’s the lucky winner since I didn’t get the email? No matter what, as always, thanks for the chances Upper Deck!!!! Congrats to Matthew for his witty ‘Papa John’s’ caption scoring him 10 packs of 2014 UD Football! Thanks to everyone for participating and come back again next week!